You have never driven a JEEP!? The Florida Keys should be seen from a JEEP! You have always wondered why your friend is soo obsessed with his/her JEEP. You have always wanted a JEEP. JEEPS are perfect for cruising around South Beach. JEEPs seat five people and have storage for tons of stuff! You used to own a JEEP and you have Tons of Fun memories in that ol’ JEEP. 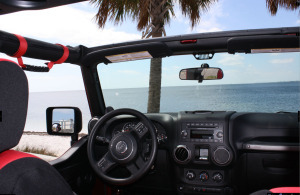 JEEPS are waterproof….take it to the Beach! Your kids will think you are really cool for renting a JEEP. No one will wave at you as you drive by them in Miami unless you are BOTH in a JEEP! I hope you enjoyed my top ten list! If you are coming to Miami or currently live in Miami, go rent a Jeep. You will really enjoy it!